2000 | Olympic Promotional Campaign | Official Site Quick Pick a Comedy or TV Special or a Play COMEDYGRAPHY 2009 - Weapons of Self Destruction 2002 - Live on Broadway 1986 - Live at the Met 1983 - An Evening with Robin Williams 1983 - Throbbing Python of Love 1979 - Reality... What a Concept! 1978 - Live at the Roxy PLAYS 2011 - Bengal Tiger at the Baghdad Zoo 2003 - The Exonerated 1988 - Waiting for Godot 1976 - The Lover TV APPEARANCES & OTHER WORKS 2013 - The Crazy Ones 2008 - SVU: Special Victims Unit 2001 - Inside the Actors Studio 2000 - 2002 - Audible 2000 - Celebrate Humanity Campaign 1994 - Homicide: Life on the Street 1991 - A Wish For Wings That Work 1982 - Faerie Tale Theatre 1982 - Mork & Mindy/Laverne & Shirley/Fonz Hour 1978 - 1982 - Mork & Mindy 1977 - Can I Do It 'Till I Need Glasses? For the first time, the IOC launched a global promotional programme during the Sydney 2000 Olympic Games. The programme is themed "Celebrate Humanity" and is designed to communicate the core values of the Olympic Games. The programme, launched in January 2000, ran on television, on radio, and in print throughout the world before and during the Sydney 2000 Olympic Games. The creative tells stories of Olympic athletes and the remarkable dedication, the friendship, the strength of character and the joy in effort that they demonstrate. The campaign rejoices in and invites the world to celebrate these values. The campaign is based on the global brand audit conducted by the IOC in 1998 and 1999. The promotional announcements, created and produced by award-winning advertising agency TBWA/Chiat Day, include six television announcements, eight radio announcements and complementary print executions. "Celebrate Humanity" was originally produced in English, French and Spanish, and subsequently translated into fifteen further languages. The English-language version is narrated by Academy Award winning actor Robin Williams. Strength is measured in pounds. Speed is measured in seconds. this desire to be a giant. Giants step over barriers that seem never-ending. They never won the silver. When you smile, I smile, that's the deal. I'll not walk past you, and not look you in the eyes, and not acknowledge you. Instead we'll pass each other and say hello. Not with our words--they're not the same--but with our faces. I meet you and see there is good in your eyes. And all the rest is easy. "Many of my favorite Olympic memories were not gold medal situations. They were inspiring moments of humanity that transcended borders, obstacles and languages--and unified people around the world. I feel this campaign conveys that, and I am proud to be a part of it." Through Val Morgan, a leading distributor of cinema advertising, "Celebrate Humanity" ran in cinemas throughout Australia and New Zealand, as well as in key markets in the United Kingdom, the United States, Latin America and the Middle East. More than 30 international airlines aired "Celebrate Humanity" in the lead up to and during the Olympic Games. 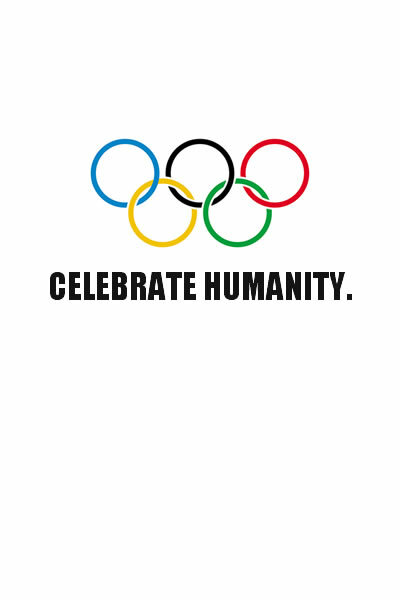 During the Games, "Celebrate Humanity" aired on large screens at each Olympic venue and Olympics Live site, as well as on screens around the world, including Kodak's large screen in Times Square, New York City. Radio, print, and other media support for "Celebrate Humanity" was extensive. "Celebrate Humanity" aired on 203 radio stations in 25 markets in the United States, for a total of more than 11,000 spots. More than 100 further countries aired the audio campaign. Broadcasters around the world aired the seven television spots providing extensive coverage for "Celebrate Humanity." In Australia alone, media partners provided more than US$10 million in media support to "Celebrate Humanity," and the slogan became a common part of the Australian vernacular regarding the Olympic Games. CNN International aired the campaign around the world for more than eight months at a rate of 30 times per day--an estimated total of more than 6,500 times.